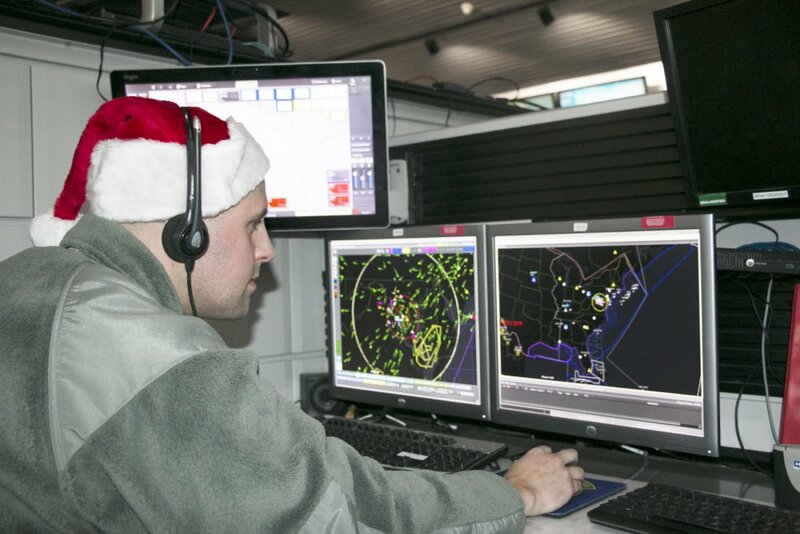 PETERSON AFB, Co. – Not even a government shutdown can stop NORAD’s annual mission of tracking Santa’s Christmas Eve journey across the globe. North American Aerospace Defense Command (NORAD(, celebrating its 60th anniversary of defending the homeland, is a binational U.S. and Canadian Command charged with aerospace and maritime warning and aerospace control of North America as well as monitoring aerospace activity globally. However, every year during the holidays, NORAD assumes the supplementary mission of tracking Santa as he travels around the world. It all started in 1955 when a local ad directed children to call Santa – only the number was misdialed. Instead of reaching Santa, the phone rang through to the crew commander on duty at the Continental Air Defense Command Operations Center, the predecessor to NORAD. The 63rd iteration of NORAD Tracks Santa kicked off Dec. 1, with a more mobile friendly website, social media channels, “Santa Cam” streaming video and a call center that will be operating around the clock on Dec. 24. More than 1,400 volunteers are expected to join NORAD on Peterson Air Force Base in Colorado Springs to help track Santa’s journey.